Conceived by acclaimed concert pianist Anthony de Mare and produced by Rachel Colbert, LIAISONS is a landmark commissioning and concert project based on the songs of legendary musical theater composer Stephen Sondheim. The Project invited 36 of the world’s foremost contemporary composers to choose a song by Sondheim and re-imagine it as a solo piano piece. Both an homage and a celebration, LIAISONS makes the case for Sondheim as one of the 20th century's most influential composers - as at home in the concert hall as on the Broadway stage. It is also an expression of de Mare’s versatility, and his commitment to contemporary composers: the Project’s roster spans the worlds of classical, jazz, opera, pop, musical theater and film. Composers hail from seven different countries and range in age from 30 to 75, representing more than 34 Pulitzers, Grammys, Tonys and Academy Awards. Since 2011 de Mare has performed over 50 different LIAISONS concerts to full houses across the U.S., Canada, Europe, Australia, and the U.K. (see Concerts page). Commissioned by individuals and institutions across the country, all 36 pieces received New York premieres over a series of three sold-out concerts at Symphony Space in 2012, 2013, and 2015. Mr. Sondheim attended all three concerts and participated in live onstage interviews in 2012 and 2013. In the fall of 2015, LIAISONS was released by ECM Records on their New Series label and promptly garnered worldwide accolades including top mentions on the "Best of 2015" lists by NPR, the New York Times, the Washington Post, Daily Beast, the Chicago Tribune, and the San Francisco Examiner. 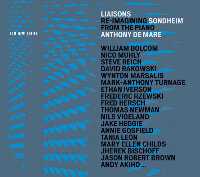 In celebration of the release, de Mare played the entire collection across a three-concert series in NYC at Birdland, The Sheen Center and Symphony Space. The complete folio of LIAISONS scores was published in the spring of 2017 and is now available from Hal Leonard; Mr. de Mare continues to perform from the collection in major cities, concert halls, and festivals around the world. 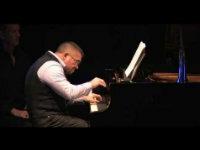 “Not just inventive piano arrangements of the songs but new compositions written in the composers’ own styles... it was fascinating to hear how each composer approached the song. Mr. de Mare’s playing was dynamic and stylish, requiring formidable virtuosity... I loved it. " "It’s not just that many of the individual new works are so appealing. It’s that de Mare’s passion and vision almost radiate from the stage. He underscores the serious nature of Sondheim’s musical accomplishment, and he causes all involved — composers, performer and audience members — to think about how music is made and how we listen to it." 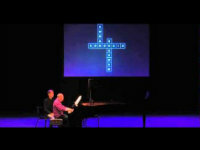 "After seeing de Mare’s triumphant performance, we definitely want to gain a deeper knowledge of the musicals. Moreover, we were impressed by de Mare’s ability to master everything from the most pyrotechnical classical compositions to the suave style of the jazz works..."
" An adventurous project... Mr. de Mare performed with vivid commitment throughout, fully plumbing the nuances of each work. " “De Mare is a dynamic pianist, with technique and musicianship to burn. For those who love Sondheim and are interested in hearing new work from a variety of contemporary composers, [Liaisons is] a must-see occasion. “The concert offered a wide range of compositional styles and moods, highly colorful, and superbly played by de Mare. RACHEL COLBERT is an independent producer, development consultant and project manager for artists and cultural organizations in New York City. booking, please contact Bernstein Artists, Inc.
"A starry who’s who of the contemporary music world... Each composer was asked to do a free treatment of a Sondheim song, and the results - on this irresistible new CD set – are little short of breathtaking… the whole undertaking is a triumph." "Background music this is not. De Mare renders lyricism with a dreamy, even gossamer touch; in rambunctious numbers, he goes gorgeously bananas. Yet even the wildest inventions never obscure our octogenarian wunderkind of the American musical... what De Mare hath wrought, with the help of his many collaborators, adds up a collective Goldberg Variations for Sondheim." I'm Excited. No You're Not. film by Crystal Arnette. Click "Donate" tab for more info. Live performance of Steve Reich's contribution to The Liaisons Project. Symphony Space, March 2013. Premiere of Thomas Newman's contribution to The Liaisons Project. Symphony Space, March 2013. Thank you for your interest in LIAISONS. Did you know that we're a nonprofit enterprise entierly made possible by the generosity of donors? It was donations that enabled us to commission the composers and record the album. But there's more to do - we are still raising funds for three key components: to complete filming and editing archival interviews with all the composers, to tour the concerts in the U.K. and abroad, and to cover the cost of the first 8 recording sessions. Please join us! All donations are tax-deductible through Fractured Atlas. Liaisons is an enormously ambitious endeavor whose launch took the support of many generous and visionary donors. We are deeeply grateful to them, and to all 145 participants of our recent INDIEGOGO campaign. Please join the LIAISONS team with a tax-deductible donation through Fractured Atlas! Contributions of any size are deeply appreciated and can be put toward various project components including commissions, production costs, archival documentation, film and video creation, and recording costs. Please see the Commissions page for a list of commissioners and their pieces. Individual pieces from the Liaisons repertoire can be combined to form an infinite variety of programs that appeal to audiences of all backgrounds, from recital series and festivals to student unions and music departments. Mr. de Mare works with each venue to tailor a program best suited to their audience and presenting needs. Single programs last from 60-90 minutes and contain approximately 11-14 pieces. As many as three fully distinct programs can be performed consecutively. Mr. de Mare delivers brief commentary between pieces, and multi-media components are also available that complement and contextualize the performance. These include background slides with animated text, audio clips from interviews with the composers, and an edited 4-minute filmed of Sondheim’s live onstage interview at the NYC premiere. The multimedia component is delivered as a specially created integrated Flash program; technical requirements are a projector with a DVI, HDMI or VGA input and/or connection to a computer running Windows XP (or later) or Mac OS X. In addition, three pieces require CD or mp3 playback along with a stage audio monitor for the performer: Steve Reich’s Finishing the Hat, Jason Robert Brown’s Birds of Victorian England and Duncan Sheik's Johanna... in space. A master teacher and lecturer, Mr. de Mare can offer residencies and lectures as well as day-, week- or semester-long curricula based on Liaisons material.